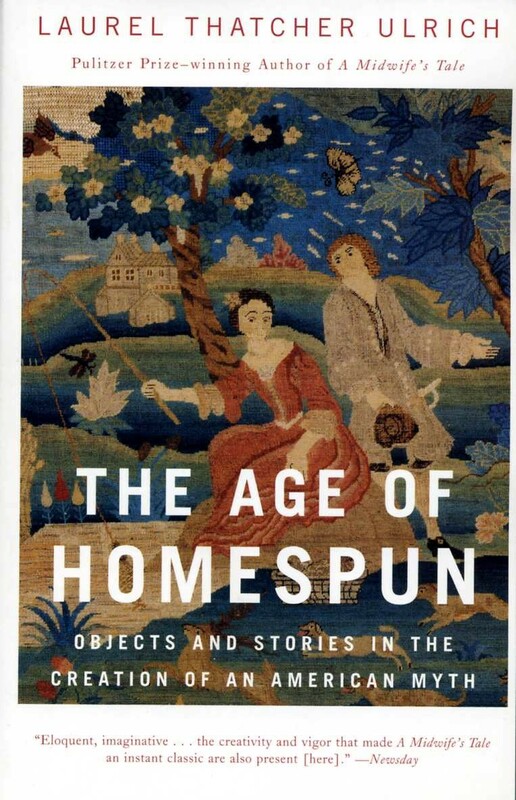 I’ve been reading The Age of Homespun–Objects And Stories In The Creation Of An American Myth by Laurel Thatcher Ulrich. It is about the role of women, and importance of the crafts and creations these women made in Colonial and post-Revolutionary America. The book discusses both the role of women in the time and the many limits to the lives that women could lead in early America. “The American pastoral, with its central signifier of clothmaking, is the subject of a remarkable new book by the Harvard historian Laurel Thatcher Ulrich. Ulrich is a supremely gifted scholar and writer. And with ”The Age of Homespun” she has truly outdone herself. Venturing off in a new and highly original direction, she has put physical objects — mainly but not entirely textiles — at the center of her inquiry. The result is, among other things, an exemplary response to a longstanding historians’ challenge — to treat objects, no less than writings, as documents that speak to us from and about the past. Much of what we need to understand the world can be found in everyday objects and everyday life. These objects can be studied and interpreted in ways that are both precise and creative. We can can look at everyday things and see the connections that exist between the people who made these things, the purposes these objects serve, the materials used, and the metaphoric value that objects hold when we consider possible ways they could be perceived by people. There is a whole big world right out in front of us each and every day. This world is founded on both fact and imagination. There is nothing in everyday life that the average person cannot understand and think about on a deeper level. Occupy Wall Street Type Protests Being Held Across The Nation—Dissent A Part Of Our Nation Since Earliest Colonial Times. 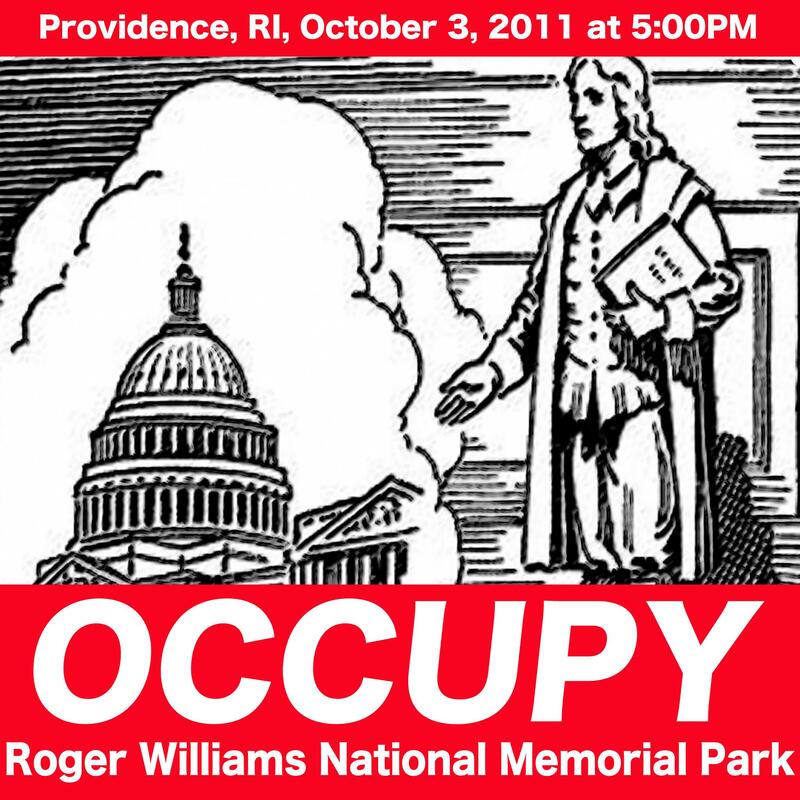 Above is the art for the Occupy Providence event that will be held later today. This art includes the great religious dissenter and the founder of Rhode Island—Roger Williams. I’m glad to say I’m a descendant of Roger Williams and that I lived in Rhode Island for 12 years. Here is the Occupy Providence page on Facebook. I’m also very glad for my 13 years so far in Houston. Here is the Occupy Houston page on Facebook. 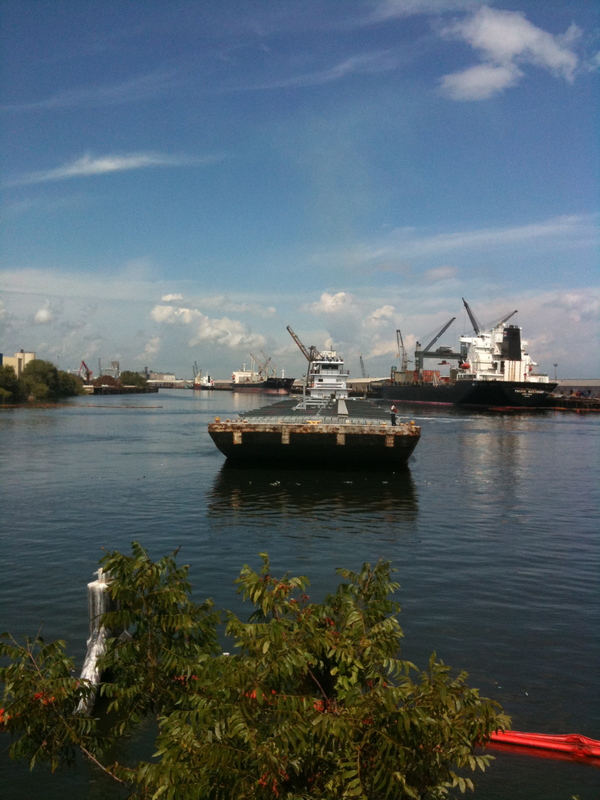 Here are details about the Occupy Houston event to be held this upcoming Thursday, October 6. This event and march begins at Market Square Park in Downtown Houston at 8:30 AM. I will be there. I hope you will be there as well. The concern that many Americans have about the corporate takeover of our nation, and about the fact that hard work often does not pay off in our nation anymore, is shared by people all over America. People just want a fair deal for an honest day’s work. Here is an Associated Press story where the Occupy Wall Street folks say they are in it for the long haul. Here is the link to the Roger Williams National Memorial Park. A book I own but have not yet read is Liberty of Conscience—Roger Williams in America by Edwin Gaustand. Below is a photo I took of the Roger Williams Memorial Park earlier this year. People lived in crude shacks. Rhode Island was founded in the 1630’s by people seeking religious liberty. The spirit of dissent and of liberty is part of the American fabric from the earliest colonial days right up to the present day. Let’s follow the Occupy protests and let’s be a part of this movement. 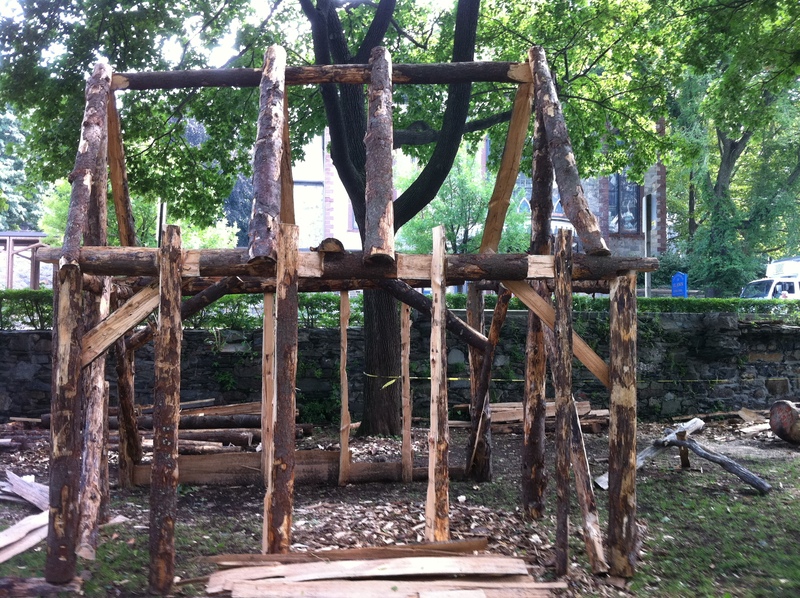 The Occupy protests may or may not lead to something bigger. We can be hopeful. We can be informed. We can be involved. 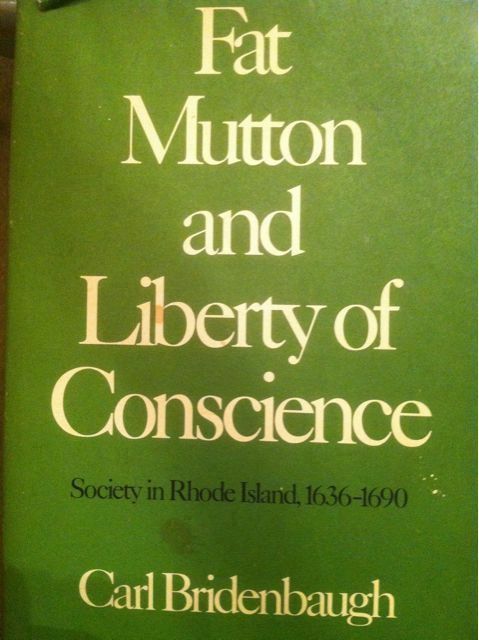 I’m pleased to share with my readers that I just found at my mom’s house in Cincinnati this copy of Fat Mutton and Liberty of Conscience—Society in Rhode Island, 1636-1690. This book was written by Carl Bridenbaugh. I’m very much looking forward to taking this book back to Houston for to read. I very much enjoy reading about Colonial America. I just can’t imagine how–no matter how good a day you are havng—that you can have anything approaching the good fortune I have had to find Fat Mutton. The Fourth of July will be here soon. What books would be helpful to learn more about the American Revolution and about America? Here are six book suggestions and a history blog suggestion that are strong sources to learn about the life in North America before colonization, after colonization, at the time of the Revolution, and to learn about the full history of our nation. With the Fourth of July just over a month away, it’s time we take back our history from the right-wing Tea Party extremists who have been allowed to commandeer some portion of our past. The so-called Tea Party wants to use our shared American history in the service of the very un-American ideals of exclusion, and of benefiting the rich over the working man and woman. One such Tea Party cell here in Texas is called the King Street Patriots. This Houston-based Tea Party outfit takes its name from the street in Boston where the Boston Massacre took place. King Street is now known as State Street in Boston. The effort to define our past is about finding justification for political positions in today’s debates. If we can prove that our viewpoints and actions in the present day match the intent of the folks who led the American Revolution, then we can claim that these viewpoints and actions have a special validity and are true to our founding ideals. The picture above is of the Old Massachusetts State House on the former King Street. I took this picture while visiting Boston in 2008. The Boston Massacre occurred pretty much at the location from where I took the picture. The yellow balcony is the place where the Declaration of Independence was first proclaimed in Boston in 1776. All people are free to visit this historic location. You can stand at the spot where the Massacre took place. 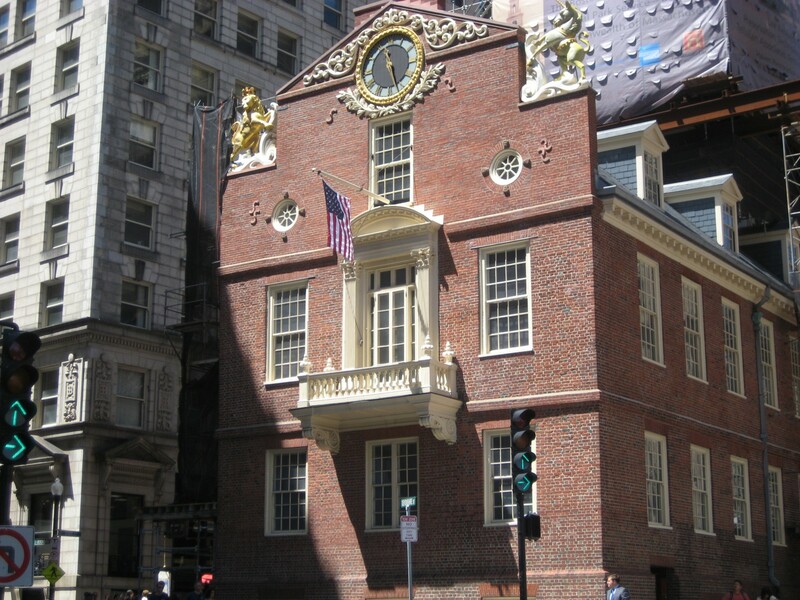 You can tour the Old State House. People of all political beliefs are welcome. People of all nationalities are welcome. There are no immigration checkpoints to see if people have the proper papers. People of all religions are welcomed. Nobody feels compelled to offer a prayer at this great and important site that favors one religion over other religions. 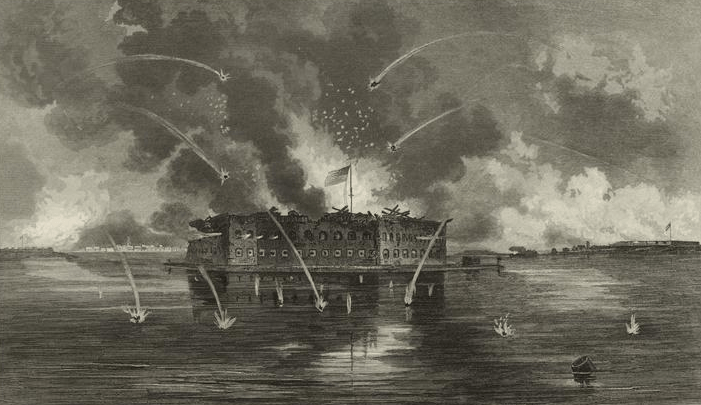 Over the next few weeks I’m going to be writing about some aspects of early American history, and suggesting books and websites for people who would like to learn more. The first book I’m recommending is Patriots–The Men Who Started the American Revolution by A.J. Langguth. Patriots is an accessible and detailed account of events leading up to the Declaration of Independence and the Revolutionary War. Good luck in finding a clear ideological lesson for today in the events describes in Patriots or in any serious account of our independence. Yes–In many ways the American Revolution was a tax revolt. At the same time, the streets of colonial Boston were covered with garbage and animal waste. Women were always pregnant and many died in childbirth. Many children died before reaching adulthood. Folks drank rum and beer all day long in part because clean water could be hard to find. Would people back in colonial times have paid more taxes for better sanitation, better public health, and for clean water? Who knows? Those folks are long dead and we live in a very different nation and world. There is plenty to learn and understand from studying our past. We’ve got to know who we are and where we come from. But nobody can take events from more than 200 years ago, and feel that they now have all the answers to today’s public policy debates. At least nobody who has any idea what they are talking about has this ability. Don’t learn your history from this blog. And be certain that you don’t learn your history from far-right fanatics who glorify states rights and who want to return to the injustices of the past. A clear example of why not to listen to representatives the far-right when they attempt to define our history can be found in this video clip of Sarah Palin talking about Paul Revere’s Ride. She simply has no idea what she is talking about. Here are some actual facts about Paul Revere’s Ride. Many on the right on are criticizing Barack Obama’s support of the mosque near the former World Trade Center location in New York City. Some of this criticism has come from backers of the so-called Tea Party. Yet as these angry Tea Party folks attempt to claim they are the heirs to our Founding Fathers by calling themselves “Tea Party”, they forget one of the bravest acts of the Revolutionary era. John Adams represented the British soldiers accused of the Boston Massacre. He did so in the defense of liberty and in the face of great public anger. 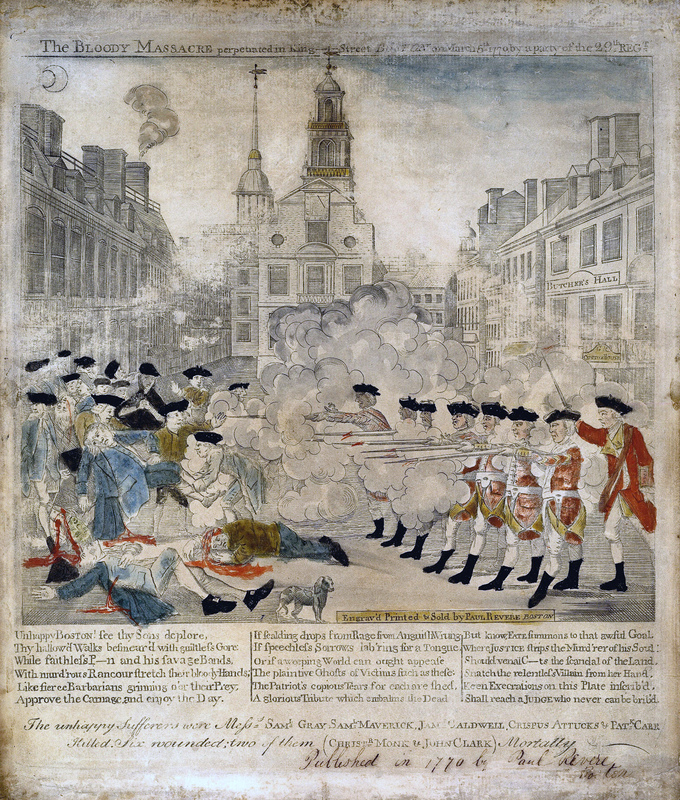 Here’s a great web page about the Boston Massacre trial. Our modern Tea Party would not know the kind of honor and courage John Adams showed back in 1770. The Tea Party is a movement that knows nothing but anger at a world not of their own design. They pick on immigrants and the poor. They are the type of bullies who would kick you when you’re down. Our Constitution protects religious freedom. The Tea Party asserts they know something about the Constitution. But the truth is, like a political movement that flourished briefly in the 19th century, the Tea Party folks are Know Nothings. Blogger’s Note—Because I have some other projects I want to take on, I’ll be offering up shorter and more formulaic posts for the remainder of August. These posts will still be quite good and will merit your visiting the blog each day. Yet at the same time, shorter posts will allow me time to accomplish other objectives. Thanks for reading Texas Liberal. Texas Liberal Book Of The Day—Albion’s Seed—Four British Folkways In America by David Hackett Fischer. This is book is shown above by my friend Hamburger Wearing An Astros’ Hat. This book is an account of the ongoing impact of British settlement in colonial America. It is interesting to see how the beliefs and habits of people who lived so many years ago are still impacting American life. You can see by how tattered the book ios that Hamburger really enjoyed this title. Link Of The Day-—The forest fires in Russia are burning trees that were coated in radioactive fallout from the 1986 Chernobyl nuclear accident. This has raised a concern of radioactive smoke. We’ve found a way in the world to make even trees be toxic. Texas Link Of The Day—Please be certain to visit the Houston political blog Brains & Eggs each chance you get. Local political bloggers do the best they can do with the time they have to make the world a better place. Here’s a picture I found this evening. Here we see this Revolutionary Era soldier bringing his colleagues a big machine gun. I imagine that is Paul Revere holding the lantern. Folks do have the right to own a gun. These are the facts. My own view is that gun owners are in many cases are a danger to themselves and others. I don’t assume that gun ownership makes somebody a bad person. I simply feel that gun ownership and the huge number of guns in America makes society a far more dangerous and brutal place than it would otherwise be. Do the folks who made this machine gun picture share the Federalist outlook of George Washington that called for a strong central government to combat the failure of state legislatures to effectively govern during the time of the Articles of Confederation? I wager they do not agree with this outlook. Instead, these folks seem to enjoy the right to own a gun without accepting the responsibility of paying the taxes needed to have a decent society, or offering any vision for the future other than a loud resounding “NO” to anything that might make people’s lives a little less difficult in these hard times. Don’t you just wish that people had invented machine guns like the one in the picture back in the 1770’s? Think of all the additional killing that could have gone on over the years, and just how powerful our guns would be today if this was the type of gun used at Lexington & Concord. And folks, no matter the lies the NRA is telling you so they can rack up more memberships and money, nobody is coming to take your gun. As many know from following the news about the Texas State Board of Education, it is okay to teach Texas schoolchildren nearly any type of wrong information. Evolution is a crock and Thomas Jefferson was not a significant participant in U.S. history–This is what you can learn in our Texas public schools under the new standards. Far right-wing ideologues have taken control of the Texas Board. As a result, kids in Texas are not getting a clear view of the facts as they really are in the world. Why would employers want to hire people educated in such a way? 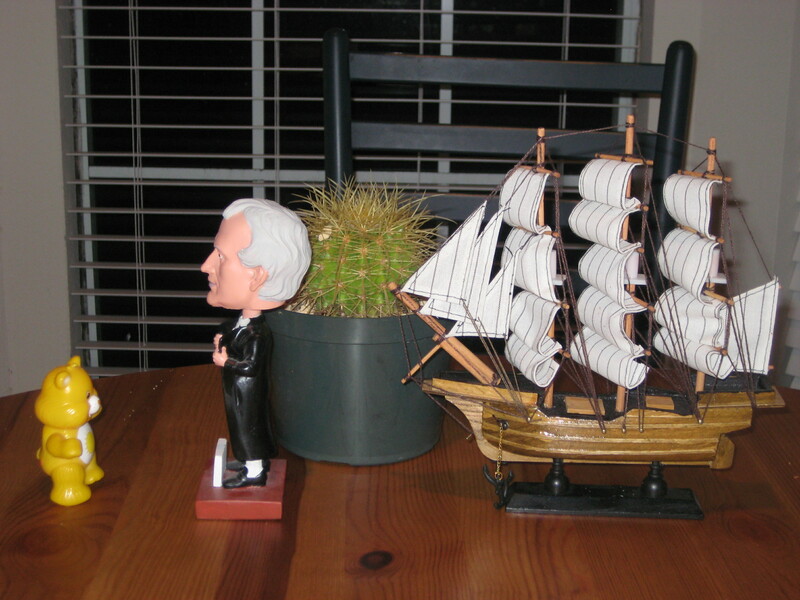 Above is a picture illustrating how the landing of the Mayflower is taught here in Texas. In Texas, you can teach our kids anything at all. It’s like a Wild West of education. You can teach anything you want so as long as you don’t get to close to what is actually the truth. I’ve been reading A New Literary History of the United States. Here is some information about this very good book. I read an essay in A New Literary History today about a book written in 1643 by Roger Williams. Roger Williams was the founder of my native state of Rhode Island. Here is a blog post I wrote about Williams. I’ve been told I’m related in some way to Williams. I hope this is the case. The name of the book Williams wrote was A Key To The Language Of America. Here is a picture of the cover of this book from 1643. 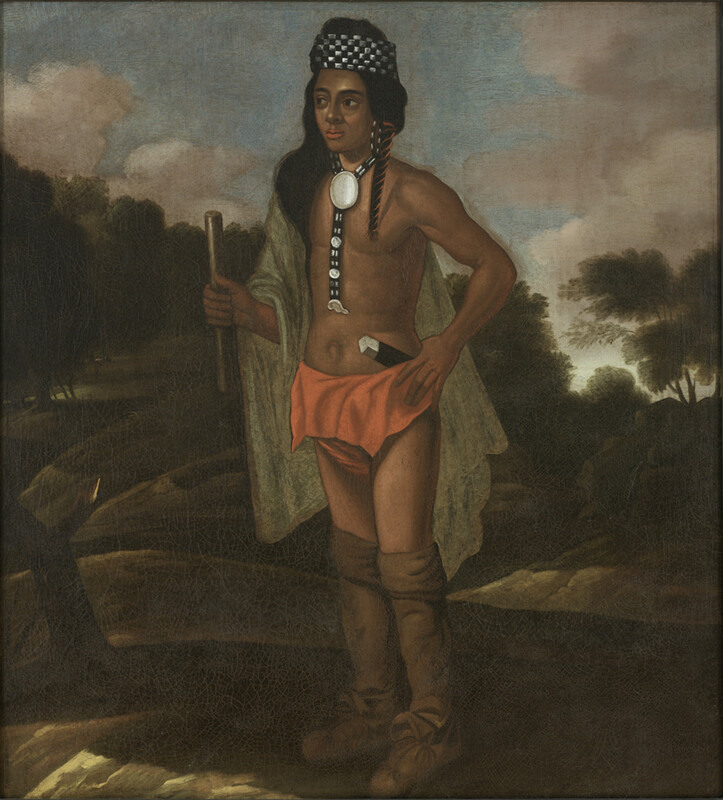 Key was about the langauge and customs of Rhode Island’s Narragansett Indians. Here is information about the Narragansett Indians. A New Literary History says that Williams saw these Rhode Island natives as equal to the New England Puritan colonists. This angered the leaders of Massachusetts because it set a precedent of treating the natives in a way that might encourage them to be more assertive in their dealings with the colonists. In A Key To The Language Of America Williams also acknowledged the role of Narragansett Indian women. This was unusual for the times. Williams wrote that Narragansett women worked at least as hard as did the men and that they never complained no matter how difficult life became. Respect for all people is connected. Regard for one only has meaning when it is regard for all. Roger Williams of Rhode Island had this insight in the 17th century. It is that many people lack in the 21st century. 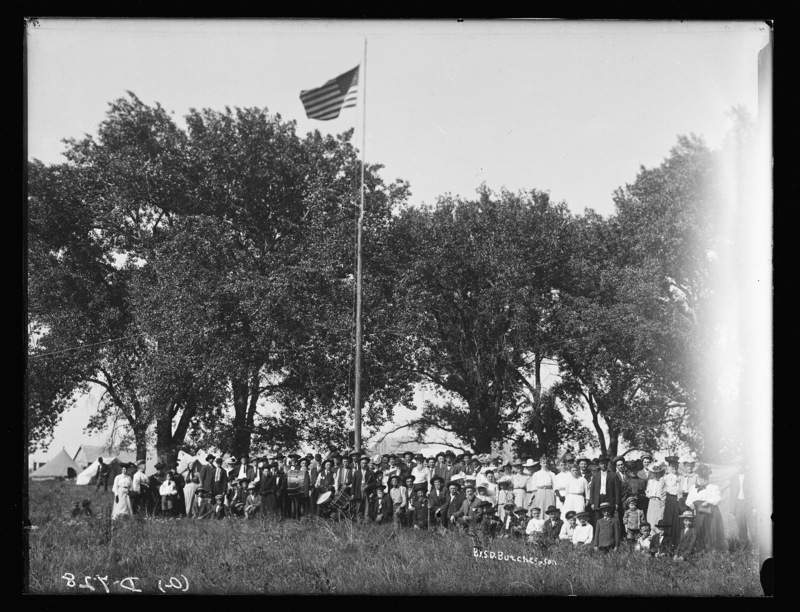 June 14 is Flag Day in the United States. Here is information on Flag Day from USFlag.org. Here is a link to the Betsy Ross House. Betsy Ross was a successful woman in many respects. Please click here to read about her life. Is Betsy Ross the mother of the U.S. Flag? Please click here and see what you think. I can write this blog post, but it is up to you learn the things you would like to know. 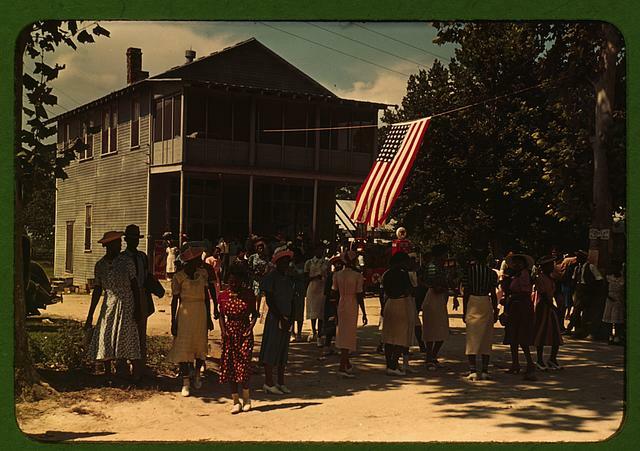 Many nations have a flag day. 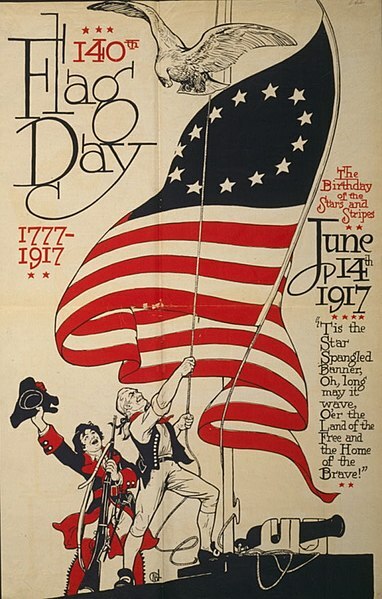 Please click here to see what nations have a flag day and on what day it is observed. Please click here for a post I wrote on a contest to create a one-world flag. The claim being made by these extreme elements, when they are not advocating violence, is that somehow we are moving towards tyranny. By trying to steal the symbolism of the Boston Tea Party, Republicans and the extreme right (no distinction appears to exist between the two) are confusing the idea of no taxation without representation with bitterness about losing last November’s election. Below is from the web home of a tea party web site. They say here that “Revolution is brewing.” Just what does that mean? Is it violence? What do they think a revolution is in this context? 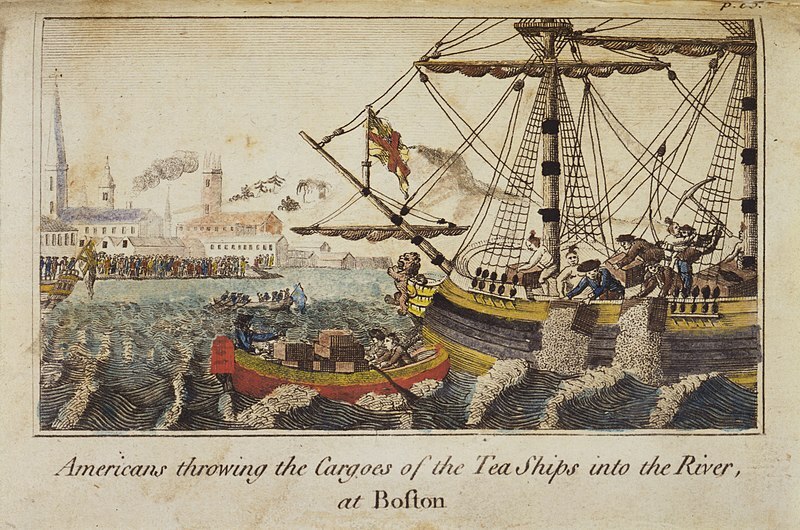 The actual New Englanders who were part of the real Boston Tea Party are the same people, or the fathers of the people, who would later become Federalists, Unitarians and abolitionists. 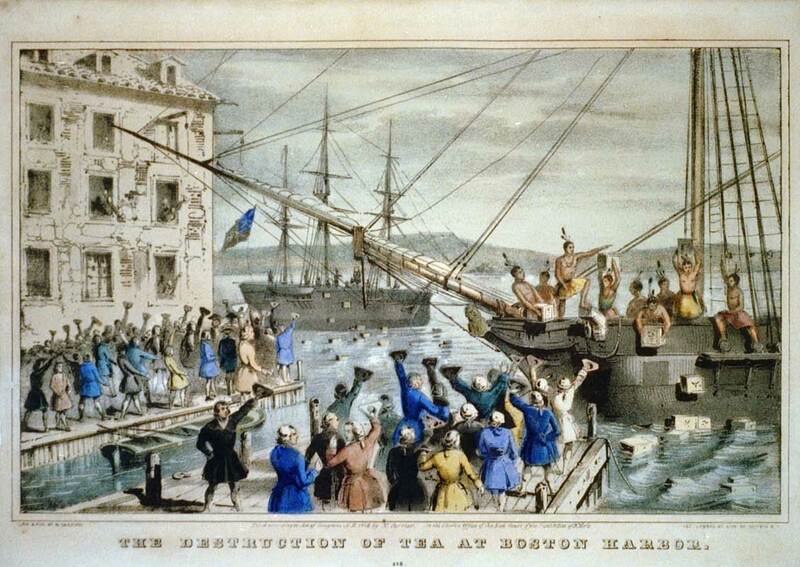 Today’s Southern-based overwhelmingly white American right has nothing to do with the legacy of the Boston Tea Party. America does have a visible representative of the best and most inclusive traditions of American History— The America of Thomas Paine, William Lloyd Garrison, Abe Lincoln, Susan B. Anthony, Sitting Bull, Franklin Roosevelt, Martin Luther King and Caesar Chavez. 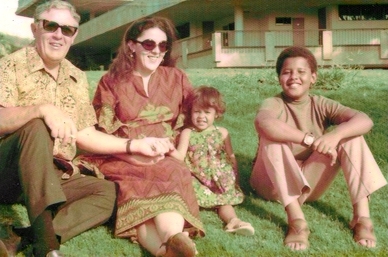 That leader is the President of the United States and his name is Barack Hussein Obama.